A very happy festive season to all of our members and subscribers and Happy New Year for 2017! 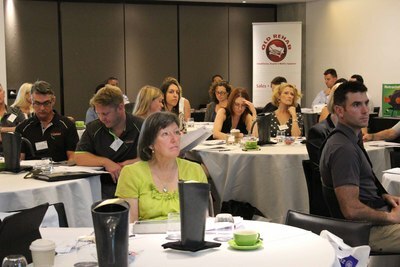 This will be a year which shapes the future of the home modifications industry in Australia. This newsletter features MOD.A's recent Annual General Meeting and changes in our Board. It also looks at how the industry may be placed when reforms in aged care begin to roll out in February 2017 and beyond to July 2018. It looks at the work MOD.A has been doing to promote home modifications as a pre-eminent strategy of wellness and re-ablement and assisting the Department of Health to identify and fix some of the difficult problems consumers have been experiencing when going through My Aged Care (MAC). We also proudly announce the 2017 MOD.A Conference, to be held at ANZ Stadium, Sydney Olympic Park on 14-15 August next year. This will be a tremendous opportunity for our sector to identify and learn from best practice in home modifications and to apply it as a key strategy toward the achievement of successful ageing in place. And we are very pleased to present an article by Liz Ainsworth about her recent tour of Canada, and the contact she made with our colleagues there from Home Modifications Canada. In 2016 MOD.A has made some significant gains, and also identified some areas where we and the sector generally, need to be making better progress. Our first national conference in Canberra was a great success, and members came together to showcase what we know we are doing well, and to listen to how we can apply our skills to the changes being made in disability service provision (through the NDIS) and in aged care reforms. We grew quickly from a national organisation with members in every state and territory of Australia, to part of an international family, establishing close ties with our sister organisations in the United Kingdom and Canada. We have work to do to understand how home modifications are to be applied consistently to the NDIS, but generally we have grown stronger through the recognition that what we deliver is critical to enabling people to remain at home (or even access community housing in the first place). MOD.A is well placed in 2017 to achieve this when it brings to fruition its Quality Standard. MOD.A will be closed from 23 December until 3 January 2017. I trust that everyone will be able to take time away from work and focus on family at this very special time, and I look forward to future challenges and working with all of you in 2017. MOD.A's 2016 Annual General Meeting was held at the Vibe Hotel in Sydney, on 25 November. A small group of members heard about MOD.A's achievements for the year from outgoing Chairperson Anne Reeve and CEO Michael Bleasdale. The financial reports were read out by Paul Cheeseman from BDO Partners, who conducted the audit this year and last year. The meeting accepted the financial reports and endorsed new Directors and the appointment of a new auditor Foster Raffan. During our Member Forum (held prior to the AGM) members and guests discussed how reforms in aged care and disability were impacting on service delivery and what the future may hold for home modifications as reforms continue. Michelle Newman, Manager Home Support Reforms, Aged and Community Services Australia (ACSA) briefed those present about the approach being adopted by MOD.A, ACSA and the National Aged Care Alliance (NACA) toward the July 2018 reforms. That date will signal the starting point of the reform toward a single home-based programme, which is likely to be accessed by individuals through packages. Most importantly, discussion is already underway about the potential for home modifications and some other service types to be accessed outside of packages. This is a position which MOD.A will continue to support and pursue in 2017. There was also discussion about the rollout of the NDIS and concern was raised by members present about the inconsistency of approach being taken by the National Disability Insurance Agency (NDIA) toward the funding of complex home modifications. Despite being promised a policy paper by the middle of the year there is no documentation available which sets out a consistent and coherent approach, and there appears to be significant variation in the way that each region is dealing with home modifications. Some members were concerned that locally established rules are serving to either disqualify them from work or at least making it hard to operate. As a consequence of these discussions, MOD.A will write as a matter of urgency to the NDIA to express concern and to seek a meeting as soon as possible to address these issues. It is with a mixture of regret and gratitude that I announce that Anne Reeve has relinquished the position of Chairperson and stepped down from the Board of MOD.A. Anne joined State Council in 2000 and was Treasurer on two occasions. She has held the position of Chairperson since 2012 and overseen the organisations move from Lismore to Surry Hills and its transition from a state-based organisation to a national peak. During this time, Anne has represented the home modifications industry with great effect and been a strong advocate for the sector during the HACC transition and CHSP reforms. Members and guests who attended the AGM in Sydney on 25 November were able to present Anne with a gift to mark MOD.A's appreciation for her tireless efforts as Chairperson. Anne in turn has asked that her heartfelt thanks be conveyed to MOD.A members and stakeholders for their support and to MOD.A staff and previous State Council Regional Representatives for all the support and assistance they have provided over the years. Anne is very confident that the new Board will guide the industry well and she looks forward to seeing colleagues at future MOD.A events. We will miss her but look forward to engaging with her and the staff at Scope Home Access as our organisation continues to grow and develop. Matthew Massy-Westropp is currently General Manager of the Domiciliary Equipment Service, a business unit in the Department for Communities and Social Inclusion in South Australia. Early in his career as an occupational therapist, Matthew developed an interest in health systems generally, and particularly the use of technologies that may improve service delivery. Matthew completed a master of Health Services Management at Flinders University in 2006 and used all his system and clinical experience during the development of the DCSI Equipment Program in SA. During 2015, Matthew took up a short-term position with the National Disability Insurance Agency to lead the assistive technology team there as it developed a strategy for the full scheme which was subsequently released in October 2015. Nick Schumi is a strong, passionate and active disability advocate. As a certified Youth Worker Nick specialises in youth and disability engagement with a strong emphasis on empowerment. He is the founder of the Julia Farr Youth Committee within JFA Purple Orange in Adelaide, South Australia. Nick chaired this committee from its beginnings in 2008 until 2015 and played an integral part in the implementation of the peer to peer, Julia Farr Youth Mentoring Program and Peer Support Network in which he still has an active role. Nick also has extensive board and governance experience, including: JFA Purple Orange Board of Directors and Housing Board, Ministerial Advisory Committee; and Students with Disabilities (SA). Nick has also had the opportunity to be a candidate in the 2014 State Election for South Australian based political party, Dignity for Disability, of which he is still an active member. MOD.A congratulates our Company Secretary, Michael Small, who has been awarded a Churchill Fellowship to travel overseas to study best practice in the area of building access for people with disability. Michael was closely involved in the development of the Premises Standard AS 1428 and access related changes to the BCA and over the past five years has worked closely with designers, architects, builders and building approval authorities on their implementation. How the disability community works with building professionals and regulators to encourage and monitor compliance. How they support building professionals to confidently exercise professional judgment in relation to questions of performance, flexibility and discretion while ensuring robust decision making. How appeal mechanisms work when compliant access arguably cannot be achieved. It is anticipated that there will be more consultation and negotiation in 2017 arising from the review of the Premises Standards and the information Michael brings back will likely feed into those discussions. 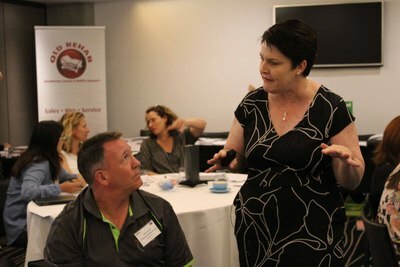 At the start of November Cheril Moran from NSW Statewide HMMS (Kurri Kurri) and MOD.A CEO Michael Bleasdale attended three days of intensive co-design workshops aimed at addressing some systemic problems being experienced in My Aged Care (MAC). The workshops were organised by the Department of Health in response to issues which had been raised by some invite-only community forums held in a number of centres across the country during September and October, including the issue of how referrals for home modifications were frequently getting bogged down and lost in the system. 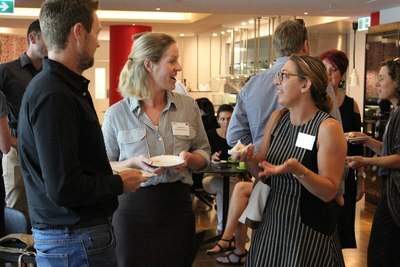 Other participants included RAS assessors, Health department (State) professionals, service providers and occupational therapists, from a number of different states across Australia. This broad cross-section gave a much fuller picture of how the problems were impacting on consumers and providers and enabled solutions to take into account the effect they would have across all parties involved in MAC. It was interesting to note how prominent problems with home modification referrals were across the system, impacting on older people by confusing them with multiple assessments and not providing much information about what to expect, including cost and timeframe. The solutions that were agreed in the workshop make for a clear referral pathway for people who require some form of environmental modification, and move away from the current process of everything passing through the RAS, regardless of whether an OT assessment already exists. To make these solutions happen there will need to be some technical changes to MAC, some information and training provided to MAC operatives and RAS staff, and also better information provided for consumers accessing MAC online. Whilst there is no confirmation about which changes will be adopted and when, MOD.A is confident that in 2017 many of the solutions proposed will find their way into the MAC system to improve referrals for home modifications. This will require the cooperation of the sector, and MOD.A will continue to work with the Department to deliver on these solutions. I recently visited Canada in September this year to run nine home modification workshops over a three-week period at the invitation of the Canadian Association of Occupational Therapists. Sites visited included Vancouver, Montreal and Toronto, with 110 occupational therapists and builders attending the events. Topics presented included an introduction to home modification practice for therapists and builders, prescribing bathroom modifications and recommending ramps and rails. the need for competencies and a training framework. Specific issues for Canadian therapists and builders included completing home visits and recommending home modifications to suit snow conditions in winter. Despite these challenges, the Canadian Association of Occupational Therapists has been providing support to their members through the provision of publications about home modifications and universal design; a position statement about occupational therapy and universal design; creating resources and supporting research efforts in this area; and conducting continuing education events showcasing home modification research and practice. During the trip, I had to opportunity to visit the Blusson Spinal Cord Centre in Vancouver with the ramps and rails workshop participants. This centre is the home to the Rick Hansen Institute, the ICORD research centre, and the multi-disciplinary Brenda and David McLean Integrated Spine Clinic of the Vancouver General Hospital. It is a research facility that features a colourful ramp in the atrium that is approximately 200 metres long; lift activation switches that extend to the floor for easy activation by people using mobility devices; public bathrooms with accessible features; and an accessible kitchen with height adjustable features. I met with Mr Don Fenn, the Chairman of the Fenn Group of Companies, President of Caregiver Omnimedia and Publisher of the Family Caregiver Newsmagazine in Toronto. Don and his team are working on an interactive portal for home modification service delivery and resources across Canada that will be launched next year. He hopes that it will also include international connections for service delivery and resources. I also met Mr Jeffrey Kerr, a Real Estate Broker with RE/MAX Unique Inc. Brokerage in Toronto, who has written a book for people buying and selling wheelchair accessible property titled Barrier Free Real Estate - Achieving Freedom at Home. My final visit included a tour of the Idapt Centre for Rehabilitation Research. The Centre is based at the Toronto Rehabilitation Institute, Canada's largest rehabilitation hospital. Staff at the Idapt Centre include over 85 scientists and over 200 graduate and post-doctoral students. Of interest were the research labs examining falls prevention strategies, sleep, how people use the home, and stair design and weather conditions impacting on mobility. Staff also discussed their work designing, prototyping, studying and testing assistive technologies for use in the home and community. Technologies viewed included their 3D printing and simulation technologies to assist with research. The trip provided some interesting insights into how people in Canada are seeking to address some of the gaps in home modification service delivery and research. I would like to thank Michael Bleasdale for facilitating the introduction to Don Fenn and staff; and the Canadian Association of Occupational Therapists for inviting me to Canada to highlight our work in Australia. Liz Ainsworth - Occupational Therapist, Access Consultant, and PhD Candidate at The University of Queensland. Following the success of the Brisbane workshop on 16 November 2016 Allianz Global Assistance and Home Modifications Australia (MOD.A) are proud to announce the first of our 2017 workshops is scheduled for the Parkroyal at Parramatta on 15 February. This workshop will once again be presented by Liz Ainsworth, a well-respected and passionate Occupational Therapist with over 20 years' experience working in the home modification sector and co-author of An Occupational Therapist's Guide to Home Modification Practice. For more information on this series of workshops visit the Events page on our website or click here to register for the Parramatta workshop. Please note that places are strictly limited. Details regarding future workshops in Melbourne, Adelaide and Perth will be announced in early 2017. Brisbane workshop images: Delegates during morning session; enjoying a break; presenter Liz Ainsworth during one of the group exercises. The Federal Government has announced changes to how it will achieve savings of $1.2 billion in aged care funding by adjusting some of the controversial measures contained in its May budget. The Assistant Minister for Health Ken Wyett announced at the Preparing for Choice and Control in Residential Aged Care conference on 6 December that the government was not proceeding with some of the budget's proposed changes to pain management and physiotherapy services funded under the Complex Health Care (CHC) domain in the ACFI. He also announced a one-year freeze on indexation of all ACFI subsidies in 2017-18 and a one-year delay in the budget's 50 per cent freeze on indexation of the CHC domain until 2018-19. Read the Department's Factsheet on the new ACFI changes come into effect from 1 January 2017 for new appraisals or reappraisals here. Time is running out to submit applications for the Dementia and Aged Care Services (DACS) Research and Innovation funding round. The funding round is a competitive process and will provide total funding of up to $34 million from 2016-17 to 2018-19. Applications close 5pm AEDT on Tuesday 20 December 2016. For more information click here. Commonwealth Home Support Programme (CHSP) service providers are reminded that data relating to 1 July 31 December 2016 can be entered at any time up to 30 January 2017. After this date, data will not be accepted and cannot be changed. This is the second performance reporting milestone for CHSP services, and the first for Victorian providers recently transitioned from Victorian HACC. If you need assistance entering your data, visit the Data Exchange website, call the Helpdesk on 1800 020 283 or email dssdataexchange.helpdesk@dss.gov.au. The Victorian State-Wide Equipment program (SWEP) recently advised prescribers in that state that it will soon implement a new service delivery model for home modifications. The new model will incorporate revised Operational Procedures, a new online Prescription Form, a registration and credentialing framework, consumer information and an updated Home Modification Prescriber Manual. There is currently no fixed implementation date but SWEP are expected to begin internal trialling of the new model before the end of the year. It is anticipated that the new model will be live early in 2017 and prescribers can expect a further communique shortly. It is expected that once live all home modifications in Victoria funded through the DHHS and non-structural modifications funded through the NDIS will be delivered via the new model. how to create a short-list of providers for comparison. If you missed this webinar when it was broadcast you can still watch it by visiting the Department of Health website here. In early November, the NSW government announced a number of long awaited reforms to Insurance under the Home Building Compensation Fund (formerly Home Warranty Insurance) that included many of the recommendations made by MOD.A in its submission to the review of the Fund. The most significant of the changes announced is that the NSW government will no longer be the sole provider of cover under the HBCF as it allows private insurance providers to enter the market. Also announced was the move to risk based premium pricing in 2017, a rise in insurance premiums, the exclusion of broker charges from premiums (it will be disclosed and charged separately), new split-cover products with $340,000 cover for non-completion as well as $340,000 for defects (as opposed to $340,000 in total and an injection of additional government funds to return the scheme to surplus. Note: All residential building work over $20,000 and less than 3 storeys must be covered by Insurance under the HBCF - an exemption applies for state-funded works for people with disability. A recent article in the Australian Ageing Agenda newsletter (2 November 2016) highlighted the results of a recent evaluation that showed that only one in five aged care providers consider My Aged Care helpful to delivering services while more than half feel it has been detrimental to their workload and ineffective in reducing administrative burden. The same evaluation showed that more than two-thirds of consumers are happy with My Aged Care's match and referral process for services but that just over one-third of providers are. The research, commissioned by the Department of Health and Healthdirect Australia, involved over 4,000 people including members of the general public, aged care recipients, carers, service providers and assessors, and other healthcare professionals. Click here to view the full article. A recent article in the Community Care Review by Dr Courtenay Harris, Hilary O'Connell and Kelly McAuliffe talks about the way home modifications produce improved outcomes when they are embedded in a reablement approach and focus on early intervention. There is worldwide evidence supporting the physical, social and cost saving benefits of home modifications and a review initiated by the Independent Living Centre WA and Curtin University School of Occupational Therapy and Social Work found that in addition to home modifications facilitating an older person's desire to remain at home they could assist in slowing the rate of functional decline, improve quality of life and social relationships, reduce symptoms, provide benefits to caregivers and improve the working environment of formal home care staff. These benefits were found to significantly improve when embedded in a reablement approach. The review also identified themes to improve service delivery and reiterated the central role OTs have in the process of delivering home modifications. To view the entire article on-line click here. The NDIS has launched a number of new FAQs that related to Assistive Technology assessment and prescription. To view click here. It does not include the application form for ILC funding or information on the selection criteria, reporting requirements and data collection. These will be included in the ILC Program Guidelines, due by the end of the year. For more information click here. resources to help case managers/advisors. To view these resources visit the Home Care Today website. At the Universal Design Symposium held in Auckland in October, Hellen Robinson from the Auckland Design Office launched the Universal Design Tool. The aim of this resource is to help planners, project managers and designers incorporate universal design into their projects to make them more inclusive for everyone. Practical design solutions are illustrated with diagrams and real life examples. The tool will run live from January 2017 and should be accessible via the Auckland Design Manual. A new adjustable handshower bracket is now available from Ewing Care Solutions - Leaders in Accessible Tapware. This new Australian designed and engineered product has a stylish ergonomic design, easy left or right-hand operation, a simple tilt-up/tilt-down grip function and click-stay handpiece mechanism, is quick to install on all 32mm grab rails and suits all styles of hand-showers. Do you have or know of an innovative new product or service that would be of interest to those that work in the home modifications industry? Contact us via email with the necessary details for inclusion in future newsletters. As part of our Agreement MOD.A will present a series of Home Modification Workshops in capital cities across the country. AGA/ Home Modification Workshop. Parkroyal Parramatta, 15 February 2017.